I set out our immediate reaction to the UK Budget in Briefing 91 on Wednesday. In the light of day, the numbers are if anything slightly worse, although a real terms revenue cut of £199m, remains the bottom line. The SPICe briefing calculates that the DEL Resource figures (that’s revenue or day to day spending) have increased by £347m over the period to 2020 compared with the plans set out in March. DEL Capital plans have increased by £509m over the period to 2021 compared with March plans. £1,115m in Barnett consequentials derive from Financial Transactions, which must ultimately be repaid to HM Treasury. Overall, the DEL Resource budget will increase in cash terms in 2018-19 by 0.7%, which represents a real terms fall of 0.8%. This real terms figure is also based on a pretty optimistic view of inflation and the GDP Deflator in the OBR report. With CPI currently at 3%, getting down to 1.5-2%% next year looks overly ambitious. And it looks like any pay increase will have to be funded from existing budgets. 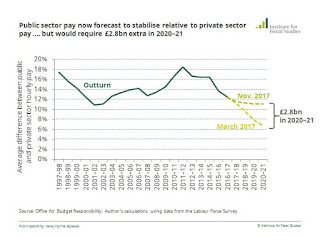 On public spending the IFS calculates that day to day spending on public services outside of the NHS is due to fall by yet another 7% over the next five years. Even the NHS is being squeezed as this table shows. The one positive from the UK Budget is the VAT exemption for police and fire services that provides around £37m extra for those services, but no backdating. There was an entertaining spat between the SNP and the Tories on this issue in the Scottish Parliament, but the truth is that neither of them have much to shout about. In short, it was UNISON that first highlighted the risk of losing this exemption when national services were first proposed. The faces and frantic scribbling at the meeting, showed that few if any officials had considered this. We were then told it would be sorted with HMRC and the Treasury. After some time and no response, we used Freedom of Information requests to tease out what was going on. It turned out that not only had the Treasury said that the s33 exemption would not apply, but the Scottish Government had been told that before they issued the final consultation. We then proposed a way of structuring national services, which would have retained the exemption. However, that was also ignored by both the Scottish Government and the Tories who voted the Bill through. As I said at the FBU lobby of parliament yesterday - the result is the loss of some £140m of revenue that could be used to keep emergency services going and award our members a decent pay rise. So, the UK Budget wash up remains pretty grim - over to the finance secretary for the draft Scottish Budget on 14 December. Not an easy task as I explain in the Scotsman, and not made any easier by Wednesday’s smoke and mirrors. 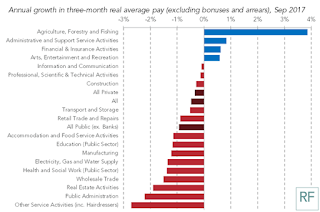 A new analysis published today by the LSE Centre for Economic Performance shows that real wages have taken a hit since Brexit and Scotland is amongst the hardest hit areas of the UK. 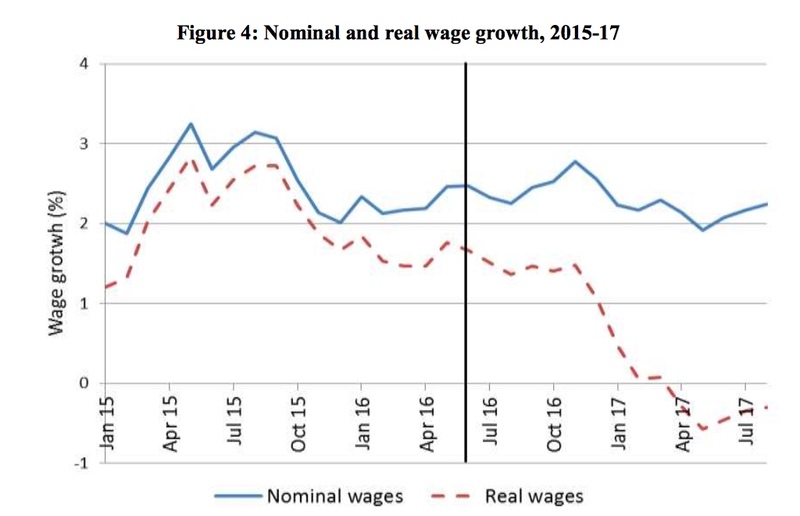 The EU referendum outcome increased prices by 1.7%, which means that real wages in June 2017 were 1.7% lower than they otherwise would have been. This decline is equivalent to a £448 cut in annual pay for the average worker. Put another way, this means the increase in inflation due to the Brexit vote has cost the average worker almost one week’s wages (4.4 working days’ wages, to be precise). Unless Brexit increases real wages in future years, this pay cut will be permanent. Households’ overall import exposure is similar throughout the income distribution. Poorer households spend relatively more on food and drinks, which have high import shares, but also on rent, which has a very low import share. Likewise, richer households spend relatively more on some high import share products such as fuels, but also spend a higher proportion of their budget on domestically produced services such as hotels and restaurant meals. 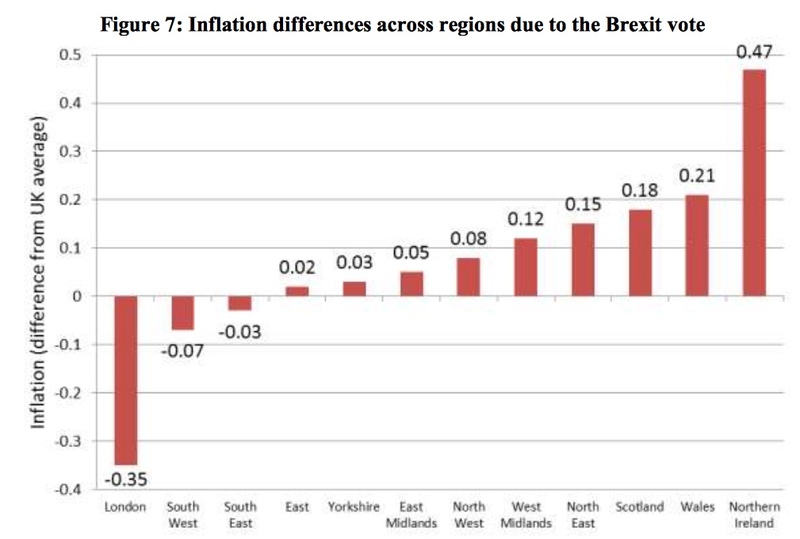 Although the inflation effect differs little across income deciles, there are stark differences across regions. In general, the north of England is harder hit than the south. Scotland, Wales, and Northern Ireland are the worst affected areas. 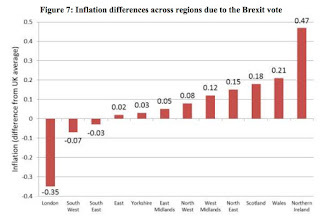 Compared with the UK average, the increase in inflation due to the vote is 0.18 percentage points higher in Scotland, 0.21 percentage points higher in Wales and 0.47 percentage points higher in Northern Ireland. This reinforces the need for the Chancellor on Wednesday to ensure that Scotland, and the UK, gets a pay rise. Today is the seventh month in a row that prices have gone up faster than wages. The Chancellor needs to wake up next week – Britain needs a pay rise. 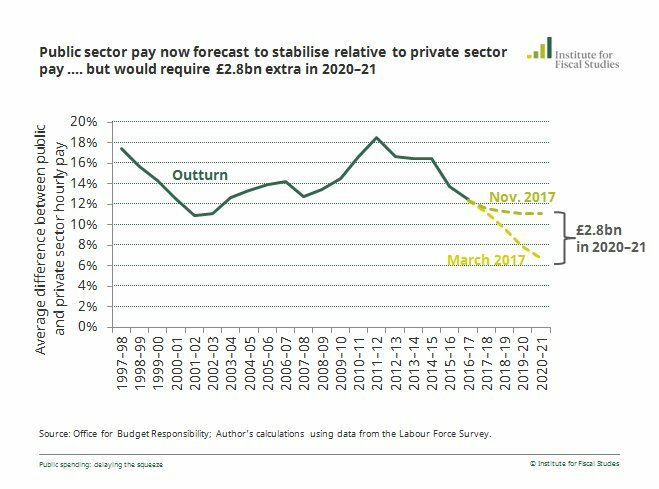 As this chart from the Resolution Foundation shows, it's the public sector that is taking the big hit. More than 300,000 people on low incomes have been given a pay boost by the UK government’s “national living wage”. Despite scaremongering from some employers that the move to raise minimum salary levels would result in massive job losses, unemployment is at a 40 year low. However, the number of people earning below the voluntary real living wage reached a record high, rising from 6 million to 6.2 million. This is the amount needed to achieve an acceptable standard of living. That’s why he needs to move the living wage for all workers (including the u/25s) towards £10 per hour. The Chancellor should also take note of the IPPR Commission on Economic Justice which has highlighted that the modest economic recovery since 2010, does not reflect the lived experience of the majority of people in society. One single finding from new IPPR analysis demonstrates that rising GDP no longer guarantees better pay in the economy. As this chart shows, between 2010 and 2016, official GDP per employee has risen by 3.5 per cent, yet real wages are 1.1 per cent lower when adjusted for consumer price inflation (CPI). If inflation is calculated to include housing costs (using the RPI measure), real wages are down 7.2 per cent. A key factor has been low productivity. 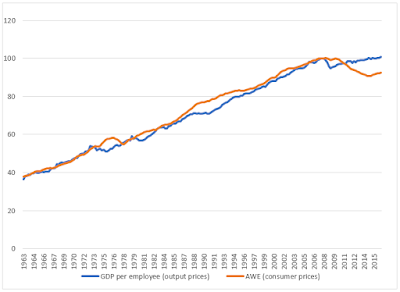 A less than virtuous circle has been created by low wages, leading to less investment despite record low interest rates. The position is probably much worse than the official figures describe. The economist Simon Wren-Lewis points to a mismatch between the ‘official’ and ‘lived’ economy. That’s because the official measure of real GDP uses an index of output prices to deflate nominal GDP into a ‘real terms’ measure. Output prices are those received by domestic producers, and they exclude things like taxes, retail and wholesale imports and profit margins. However, the official measure of real earnings is deflated using an index of consumer prices which have trended well above output prices, and to a degree not seen prior to 2010. The result is that rising living costs, as seen in consumer bills, have consistently exceeded the narrower definition of inflation that is used to measure official GDP growth. And they have done so to an extent that is historically unprecedented. This has a long-term impact on inequality, which also damages the economy. The Oxfam research report, Double Trouble, investigates the relationship between economic inequality and poverty in the UK and examines the trends in relative income poverty rates and income inequality over the period 1961 to 2015/16. They found a positive correlation between income inequality and relative income poverty in the UK over recent decades. This reinforces the growing body of evidence that high and rising economic inequality is harmful for growth and that tackling poverty alone is not enough to reduce economic disparities and poverty in the long run. The evidence also shows that redistribution is not damaging for economic growth, as even the IMF now concede. A point the UK and Scottish governments should consider in tax and wealth policies. In next week’s budget the Chancellor needs to recognise that a low wage, low productivity Britain isn’t the way forward for the economy. 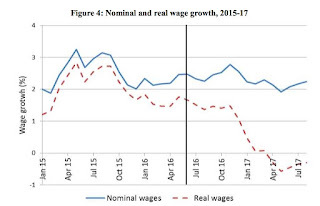 A real term pay increase for public sector workers, coupled with a £10 minimum wage, is an important starting point in breaking this downward cycle of decline. The health impact of shift working is not well understood. We need more research and better risk assessment to protect workers. The numbers of staff working shifts is increasing and there has been a marked increase in those working night shifts. While traditionally more men than women have worked shifts, that is changing with most of the new shift workers being women. Scotland has always had a higher proportion of shift workers than the rest of the UK and a range of UNISON’s public service workers are involved including the emergency services, hospitals, social care and in the energy sector. I was in Stirling today, outlining the health implications to our police branch stewards and discussing how we can help members by designing work better to address these issues. The research on this issue has identified a number of risk factors associated with shift workers. They are more likely to be obese, suffer from diabetes, smoke (particularly women) and eat less healthily. Interestingly, they are also more likely not to drink alcohol. While there is a statistical correlation between shift workers and these conditions, it is less clear what the causal link is. Shift workers are also more likely to be in lower income groups, who generally have poorer health. 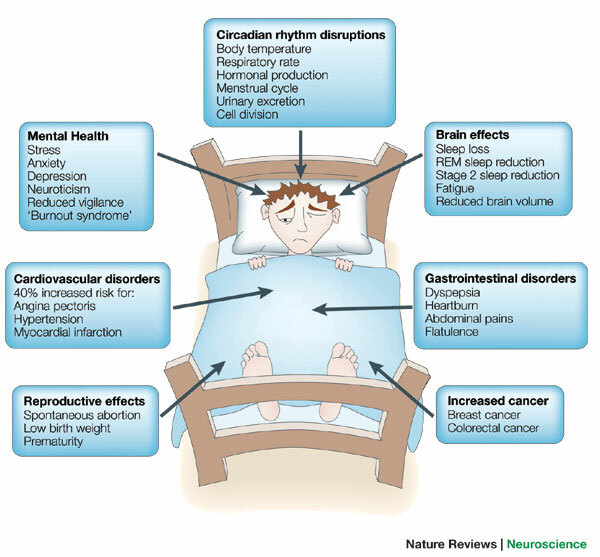 Likely explanations focus on the disruption to circadian rhythms, the body’s internal clock. This can disrupt the workings of the hormone Melatonin, which can lead to poor sleep. We know that the lack of good quality sleep has been linked to obesity, depression, diabetes and heart disease. A particularly worrying study showed that women working on night shifts for more than 30 years are twice at risk of breast cancer. This is thought to be linked to less Melatonin, which has cancer protective qualities and increased Oestrogen that has the opposite effect. Another issue is a 40% increase in the risk of cardiovascular disorders. 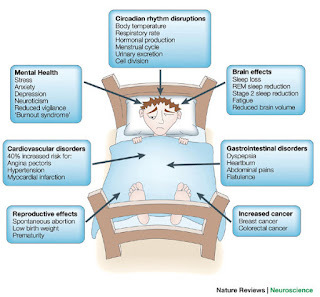 The causal reasons are unclear, but again the disruption to the circadian rhythm, damage to family and social life, stress and poor diet are obvious contributing factors. So what can be done to limit the risks? One health site gives the unhelpful advice of ‘get another job’! Although impractical and drastic, it may well be good advice for the over 40’s and those who have worked on shifts for many years. Some behavioural solutions help, such as establishing a stable sleep environment and schedule. Eating small health snacks on shift rather than a large meal, together with exercise and limiting stimulants like caffeine and energy drinks. We should also be revisiting risk assessments with employers. This involves evaluating shift schedule design - avoiding split shifts, excessive 12 hour shifts and rotating shifts forward. There should be at least 48 hours between shift changes to allow the body to adjust. Occupational health should identify and treat workers who have sleep disorders and ensure more regular health checks from age 40 and those who have worked shifts for more than ten years. Finally, we need more research to understand the causal links between shift work and ill health. In the meantime there needs to be better awareness of the risks and the actions workers and employers can take to minimise the risks. Richard Leonard's proposed Wealth Tax has attracted some comment on its legality. Here is a guest post from Thompsons Partner Patrick McGuire, setting out why he believes the tax is sound in policy, principle, politics and law. Thompsons have had some brilliant trainees over the years; some of the best (I was one myself at one point in the dim and distant past). But even the best trainees need, well, trained; and I think the most important lesson for a new lawyer is to read the case law and think for yourself. We all fall into the same trap at first. We think that longer is better. We think the answer is found in text books. We fear offering our own opinion. This approach can result in articulate, wide ranging pieces of work with lots of quotes. All too often however the absolutely crucial point is barely analysed at all. 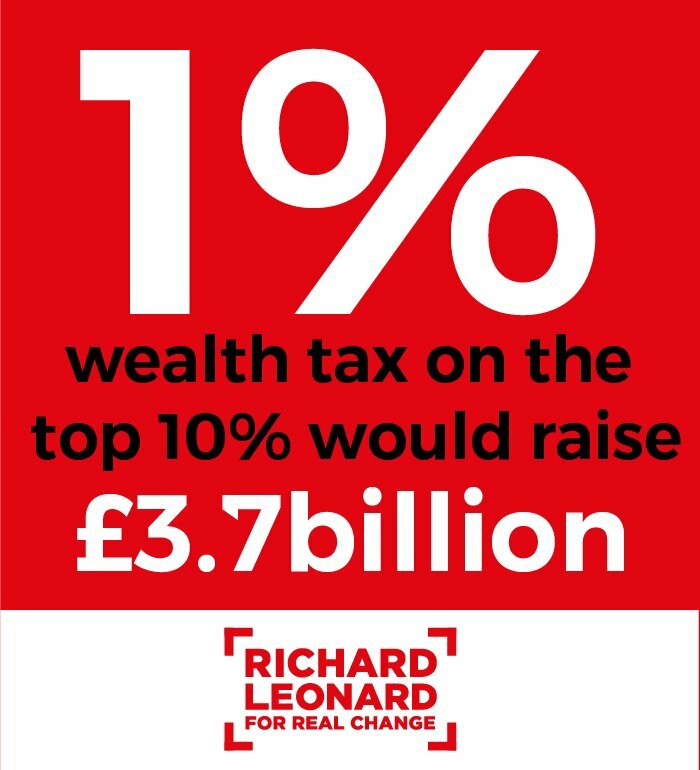 I read a blog recently on Richard Leonard’s Wealth Tax proposal that seemed to follow that approach. It was very lengthy. It had lots of headings. It had a huge number of quotes from the various Scotland Acts. It was on the face of it impressive and perhaps even convincing when it delivered the damning verdict that the Scottish Parliament could not introduce a Wealth Tax. But when it came the key point of the key legal principle the analysis was all a bit flat and dare I say superficial. The blog correctly identified that an Order in Council would be required under section 80B of the Scotland Act 1998 as amended. But the author of the piece couldn’t help trying to over egg how arduous a process this would be. Speed in fact the defining characteristic of secondary legislation such as Orders in Council. If there is political will, there will (good that) be no problem. The only issue is whether a Wealth Tax would breach Article 1 of Protocol 1 of the European Convention on Human Rights [A1P1]. It took the author of the blog 22 paragraphs to get to that absolutely fundamental point before summarily dismissing the Wealth Tax on the basis that taxing a minuscule [my words not his] 1% of the most wealthy’s wealth would breach their right to “peaceful enjoyment of [their] possessions”. I think not. I’d suggest it’s a bit more complex than that. What constitutes a breach of A1P1 has been the subject of several decisions of our highest court. It is those cases and the written judgements themselves to where we must turn for an answer. I have been involved, to a greater and lesser extent, in two of the most relevant court decisions; both judgements of the UK Supreme Court. The cases are Axa and others v Lord Advocate ; and Counsel General for Wales . Both cases related to legislation aimed at assisting victims of asbestos related disease. It is a question of balance - what is the benefit to society weighted against the cost to the impact on any individual affected. This is sometimes described as the ‘proportionality test’ which comes downs to the same thing - is any negative impact proportionate to the benefits; and can the benefit be achieved by any other means. Against that test set by the Supreme Court how does the wealth tax stack up? (ii) is the measure connected to the test - yes. (iii) could an alternative less obtrusive method be used? There is no alternative method to the one off fiscal ‘adrenaline shot’ the Wealth Tax will provide. A significant one off financial injection is required to entirely reshape Scotland’s welfare system and public services. The only way this can be achieved is through a one off Wealth Tax levied against those in our society with the most wealth. In terms of “obtrusiveness” I take the view that a levy of only 1% can not be viewed as obtrusive. (iv) benefits v disbenefits? The benefits are enormous. They will change our public services for a generation. The disbenefit is a minuscule 1% of the wealth of the most wealthy. Against a detailed analysis of the case law I therefore have little doubt that the Wealth Tax would be legal. Morally, I have no doubt that it is the right thing to do. And constitutionally, if the Scottish people called for an Order in Council under s80B that Westminster refused we would be at a crisis that no one would want or tolerate. In summary, the Wealth Tax is sound in policy, principle, politics and law.